Guanajuato is a city and municipality in central Mexico, in part of Bajío. It is in a narrow valley, which makes its streets narrow and winding. Most are alleys that cars cannot pass through, and some are long sets of stairs up the mountainsides. Many of the city’s thoroughfares are partially or fully underground. The historic center has numerous small plazas and colonial-era mansions, churches and civil constructions built using pink or green sandstone. 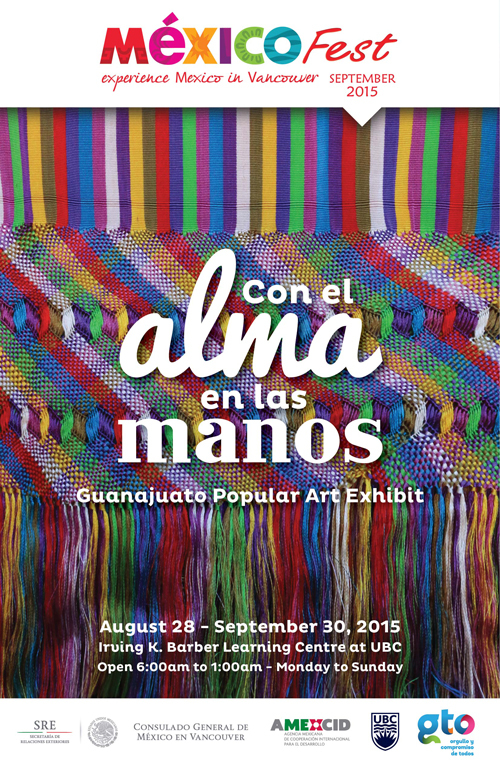 “Con el Alma en las Manos” will be displayed at the Irving K. Barber Learning Centre as part of Mexico Fest 2015 from August 28 to September 30. Come check it out! 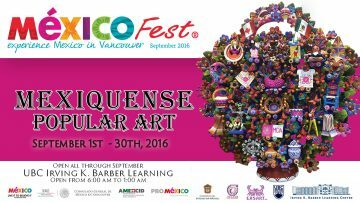 As part of the Mexico Fest 2014′s “Yucatan – Popular Art” exhibition at the Irving K. Barber Learning Centre, an academic lecture will be presented at UBC Robson Square (800 Robson St, Vancouver, BC V6Z 3B7). 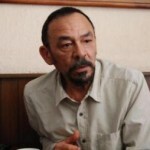 Dr. Carlos Eduardo Bojorquez Urzaiz is a writer, anthropologist and Mexican historian. Dr. Bojorquez-Urzais is currently Professor in the Department of Anthropology at the Autonomous University of Yucatan since 1976. He served as Director of the School from 1985 to 1993. He received his Ph.D. in History at the University of Habana. Dr. Jose Antonio Cutz-Medina is a distinguished professor and educator, who is recognized for his work in maintaining the roots of Mayan culture through his efforts in giving Mayan dignitaries space and opportunities for dialogue between ancient knowledge residing in Mexico’s Yucatan region. His efforts have connected the struggling people of Kanxoc with its surrounding municipalities. 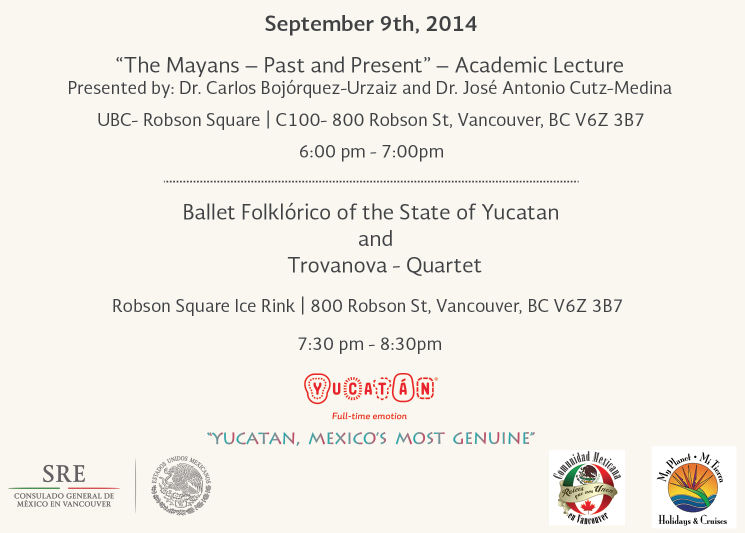 The Irving K. Barber Learning Centre and the Consulado General de México en Vancouver are pleased to bring to UBC campus this unique exhibition from Yucatán, México as part of the city’s celebration of Mexico Fest 2014. Located in Southeastern Mexico, on the north part of the Yucatán Peninsula, Yucatán is bordered by the states of Campeche to the southwest, Quintana Roo to the southeast and the Gulf of Mexico lies off its north coast. 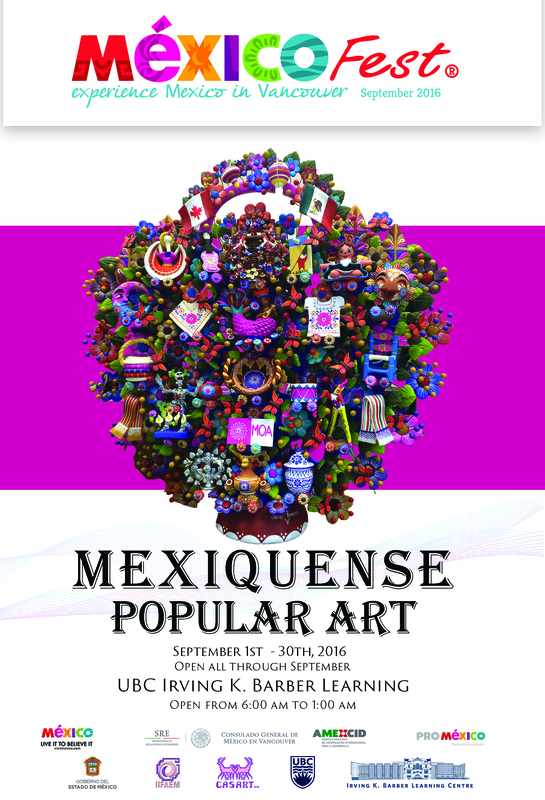 In Yucatan there are more than 150,000 people who in one form or another make their living from Arts and Crafts mostly by participating in their production or comercialization. In a population of 1,900,000 inhabitants, we are looking at almost 8% of the population being dependant on Arts and Crafts. Aside from their economic contribution, this promotes and maintains local culture. 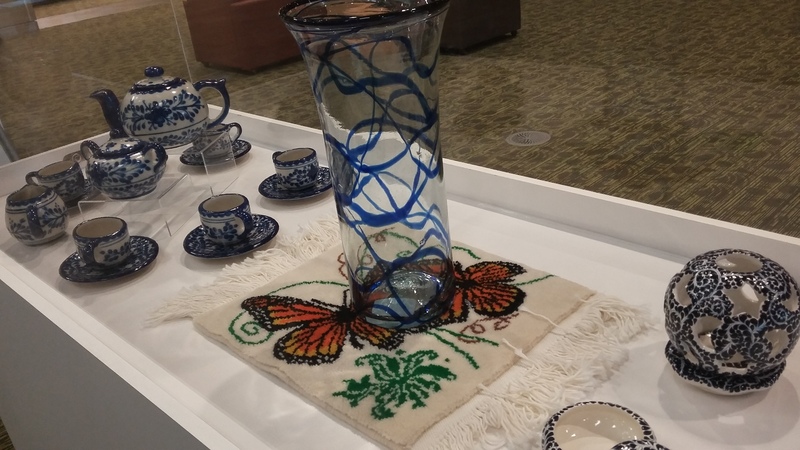 For the Department for Visual Arts of the Ministry for Culture and Yucatan Arts, this exhibition represents an opportunity to share and spread the important work of the Yucatan artisans. 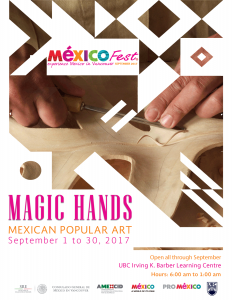 Arts and Crafts, embroidery, goldsmithing and wood carving are cultural expressions that significantly contribute to the cultural identity of the people of Yucatan. There is nothing more emblematic about this state than the “hipil” (dress), a “terno” (three piece suit) or woven hammock. The study of these objects helps us better understand the history of Yucatan, its natural resources and above all; the different habits and traditions that make up the everyday lives of these people. 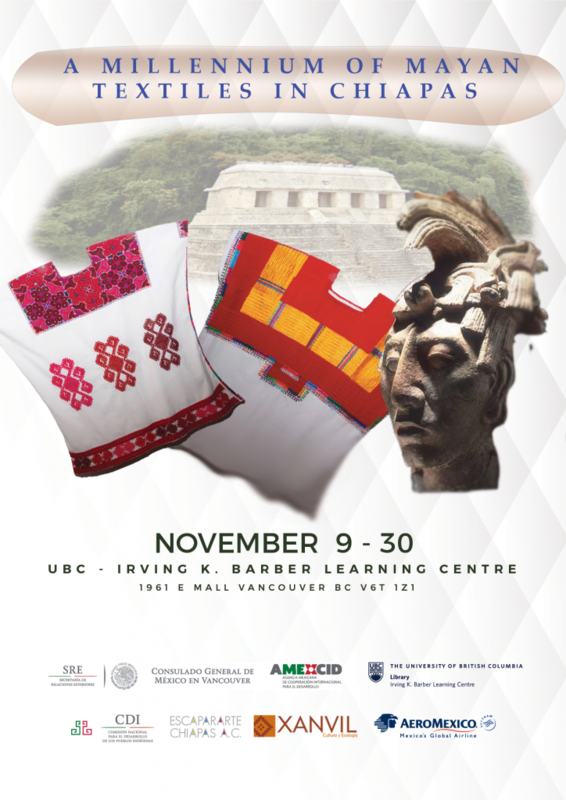 For more information about this exhibition, please contact Allan Cho, Community Engagement Librarian at the UBC Library’s Irving K. Barber Learning Centre. 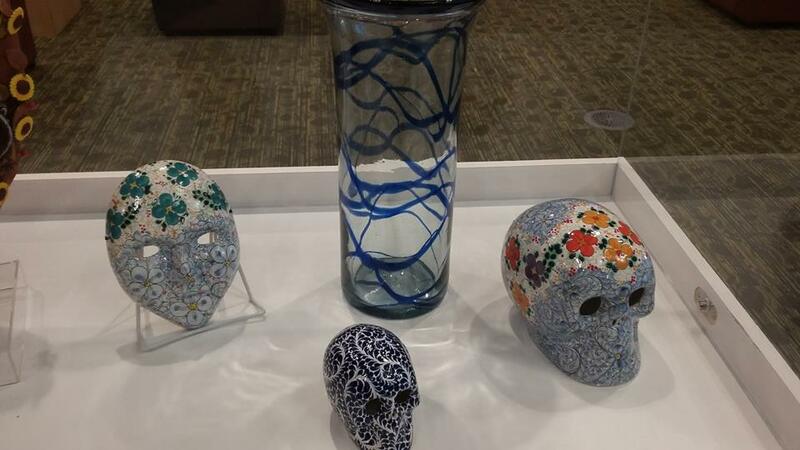 From September 5 to 15, 2013, Mexico Fest 2013 presents Baja California Sur Artifacts, an art exhibition, located at the Irving K. Barber Learning Centre’s second floor foyer. Baja California Sur (Spanish pronunciation: [ˈbaxa kaliˈfornja sur], lit. “Lower California South”), became state of Mexico in 1974. 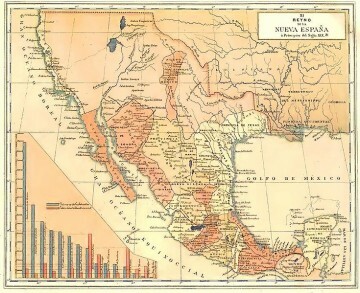 The second smallest Mexican state by population and the thirty-first admitted, the area was known as the South Territory of Baja California. 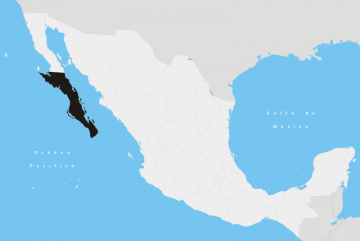 The area of Baja California Sur is approximately 73,475 km2 (28,369 sq mi), or 3.57% of the land mass of Mexico and occupies the southern half of the Baja California peninsula. 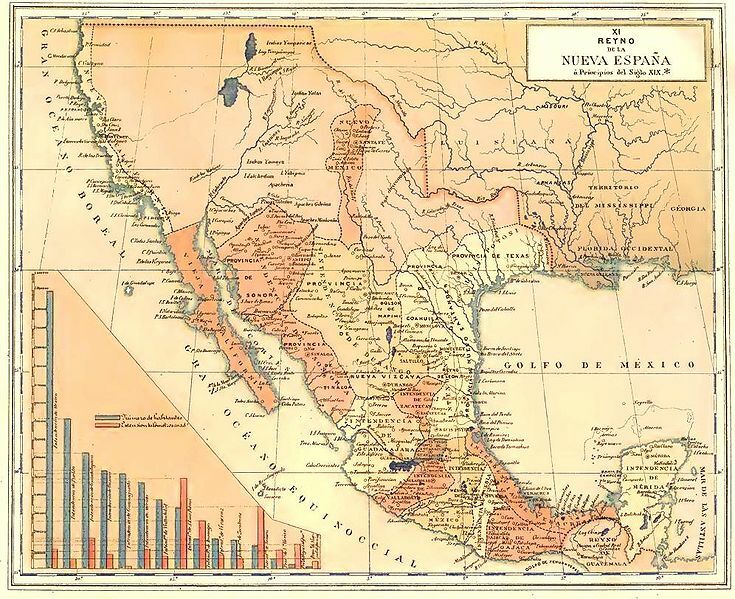 It is bordered to the north by the state of Baja California, to the west by the Pacific Ocean, and to the east by the Gulf of California, also known as the “Sea of Cortés,” Baja California Sur has maritime borders with Sonora and Sinaloa to the east across the Gulf of California. The state includes Loreto, the historic first capital of all three Californias (Baja California Sur, Baja California, and California), the town of Santa Rosalía which is the site of a historic church designed by Gustave Eiffel. The smoke stack of the silver smelters in El Triunfo, Baja California Sur was designed by Gustave Eiffel. Eiffel never visited Baja California Sur, rather his early architectural works were sold as ‘cookie cutter’ designs and can be seen in hundreds of locations around the world. Although the silver industry ended full scale production in the 1950s the stack and ruins of the silver industry remain as a significant landmark today. Baja California Sur is characterized by deserts, mountains and coastal flatlands. The climate is arid in most parts of the state, with the southernmost tip being tropical. Plants such as cardon, mezquite and wild-lettuce; animals including mountain lions; and other plants and wildlife characteristic of this ecosystem are found in the Central and Vizcaino Deserts of Baja California Sur.